For years, growers have developed their own ways of determining when it’s time to harvest their crops. A few years ago, engineers and scientists at Felix Instruments- Applied Food Science, in partnership with Central Queensland University of Australia, teamed up to develop the F-750 Produce Quality Meter. “This instrument allows growers to non-destructively gauge the maturity of fruit,” says Chelsea Gaya with Felix Instruments. Originally developed and designed for mangoes, the F-750 Produce Quality Meter has a range of starter models for fruits such as avocados, apples, grapes, and cherries. This fall, Felix Instruments took the F-750 device a step further. The company partnered with Kerry Walsh, a professor at Central Queensland University and his research team to utilize the fields of Calypso Mangoes in creating the world’s first FREE fruit maturity app: Fruit Maps. This program takes data generated on the instrument and put it into a visual format that can be accessed easily. Fruit Maps will be available to all F-750 Produce Quality Meter users. “The goal of Fruit Maps is to approximate harvest dates and volumes at different levels of fruit development (flowering, fruiting), as some decisions must be made before fruit is set on the tree,” says Nicholas Anderson with Central Queensland University. “It is designed for the grower, to assist in the decision to harvest,” added Kerry Walsh. “This is particularly useful with larger operations, with many fields in different areas.” Gaya adds that “If a farmer can more accurately predict a peak harvest time, their product can arrive in better condition than their competitor’s. Additionally, by tracking water, heat, and flowering events, a farmer can potentially massively reduce waste and increase profits.” The data is also useful in conversations down the marketing chain, giving confidence in the quality of the fruit. “The system has been designed to be very easy for Farmers to use. Initially a lot of data does need to be entered - this allows for a solid and accurate foundation and calibration of the farmer’s particular crop to best predict peak harvest time,” mentioned Anderson. At present, Fruit Maps is in its final development stages and exists as a website with credentials provided to F-750 Produce Quality Meter beta testers. 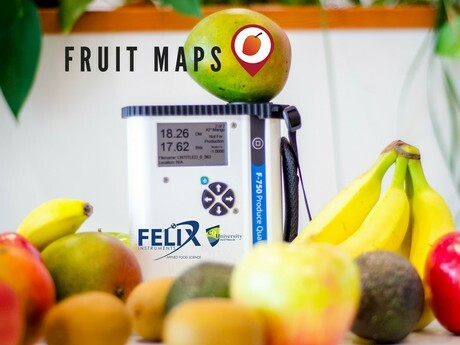 In the (very) near future, Felix Instruments is investing their energy to turning Fruit Maps into a phone app, allowing farmers to see the readings from the F-750 in real time whether they are at home, on the road, or in the field.